Part I - It’s Chaos Out There! Most mainstream business books are written for senior and executive management. But Mastering Business Chaos is for the other 95%, the people who perform the vital day-to-day work of the organization and their managers. These 12 Secrets reveal essential critical thinking skills and hands-on tactics that enable you to create substantial customer and business value using the resources readily available to you and within your control. I believe that anyone, in any organization, can substantially improve the effectiveness and efficiency of the work they do using the critical thinking skills and tactics presented in Mastering Business Chaos. The 12 Secrets are tools; they enable you to demystify and leverage chaos to your advantage without formal projects, capital investment, changes in information technology or sign-offs from senior management. This book is for those individuals who want to take their work to the next level and proactively seek out and identify opportunities to take action and to create customer and business value. These people are indispensable to their organizations. I call these people "Playmakers." 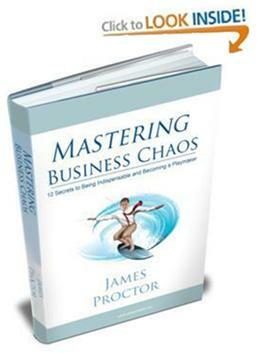 James Proctor is the Director of Professional Services for The Inteq Group, Inc. and author of Mastering Business Chaos. He frequently lectures on business strategy, innovation and business transformation and serves on the board of commercial and non-profit organizations. 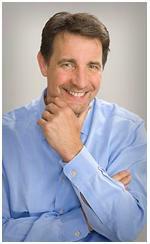 Proctor is the author of Inteq’s acclaimed Business Analysis training series - reaching over 300,000 business and I.T. professionals worldwide. Proctor developed Inteq’s MoDA/Framework™ and Inteq’s BPR360/Framework™ - which have been adopted as a standard for business analysis by organizations around the world. In his book, Mastering Business Chaos, he reveals secret patterns he has discovered in thousands of client interactions ranging from Fortune 500 to emerging growth companies and government agencies throughout the spectrum of industry. In the mid-1980’s, Proctor founded the Inteq Group, Inc. Today, Inteq is a team of top industry professionals that provide business analysis training and consulting services, application software development services, and big data solutions to commercial and governmental organizations worldwide. Proctor has a B.S. in Industrial Management and Operations Research and an MBA in Information Technology from Indiana University. He started his career with the firm of Ernst and Young (formerly, Ernst and Whinney) with their consulting group in Dallas and specialized in the aerospace, financial services, manufacturing and defense industries. For more information visit James’ blog site. The concepts in Mastering Business Chaos are new and original; they are proven and practical. They are born in the unique circumstances of Proctor’s extraordinary access to organizations worldwide. He is invited to go deep inside business in ways most people never see. This book is destined to become a business classic. 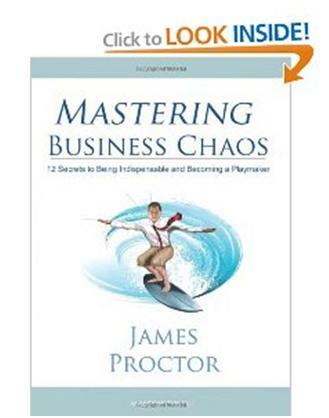 The 12 Secrets revealed in Mastering Business Chaos are an unprecedented distillation of Proctor’s decades of experience. Reap this wisdom, apply it and gain an extraordinary edge in your workplace. Today, more than ever, the people that are able to optimize existing resources to create business value, regardless of the economic climate, are recognized as proactive, resourceful and indispensible. You can apply the concepts in Mastering Business Chaos right now with the resources already available to you and within your control. You do not need sign-off from senior management, formal projects or additional investment in information technology. Being indispensible is job security. Job security is important regardless of the strength or weakness of the economy. Mastering Business Chaos provides the tools, techniques and tactics to become indispensable. Mastering Business Chaos puts you in control. You are not at the mercy of chaos. While others are mired in chaos you are moving forward and creating real customer and business value. Mastering Business Chaos is more than being indispensible; it makes you a playmaker. Playmakers objectively assess their strengths and weaknesses and those of their team; they leverage strengths and proactively work to improve weaknesses. Playmakers optimize resources to create exceptional customer and business value. And, just as in sports, playmakers distinguish themselves from their peers and are exceptionally well compensated for their contributions. Mastering Business Chaos will change your personal paradigm. You will develop a formidable personal skill set that applies anywhere in your organization independent of your role or job function, independent of technology and industry. This skill set is your personal edge. You will continually improve, refine and adapt these skills throughout your career. In addition to optimizing your own work, you will become a valuable mentor to your team. Work specifications and mutual expectations are often ambiguous and poorly communicated across workflows and throughout the organizational hierarchy, resulting in operational inefficiency and staff frustration. With the techniques presented in Mastering Business Chaos you will overcome the problems resulting from others’ poor communication skills. You will communicate clearly, precisely and unambiguously; you will proactively take ownership of communications. A key factor in career advancement is the quality and depth of the knowledge and skills that you acquire through experience. Putting out fires and keeping up with the relentless flow of day-to-day tasks does not leave time to advance your skills. The skills that you acquire from Mastering Business Chaos will enable you to get out in front of the workflow. Then, you can focus on refining these skills through meaningful experiences that result in career advancement. On the surface, chaos in business manifests as disorder and unpredictability, a significant source of stress to many people. Stress consumes productively. Chaos, however, is more apparent than real. With Mastering Business Chaos you will identify the hidden sources of chaos that impact your work. You will learn to harness chaos to your advantage. Demystifying chaos reduces the stress and puts you in control. Autonomy and independence, in most work situations, is empowering, highly productive and personally gratifying. Autonomy and independence is built on confidence that must be earned. Mastering Business Chaos provides the framework that enables you to increase your level of autonomy and independence. You will learn techniques to inspire confidence and reduce management intensity. Mastering Business Chaos is not just about success in business. The secrets are transcendent; you will instantly see how they apply to your personal life. With a clear mind, mastery over chaos and a way forward, you will be on the path to achieving your own personal best.